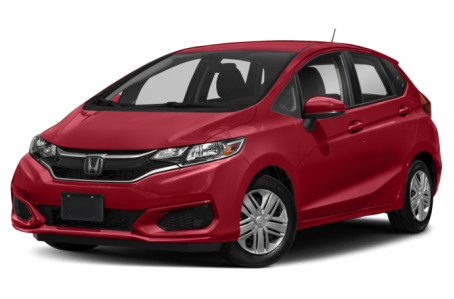 The 2018 Honda Fit is a compact 5-door hatchback that has impressive cargo capacity for its diminutive size. It competes with the Ford Fiesta, Mazda3, and Nissan Versa Note. This year, the Fit gains a new Sport trim level. Four trim levels are available: LX, Sport, EX, and EX-L. The Fit has a short profile with sharp angles and creases that run down both sides of the hatchback. In some ways, it looks like a smaller version of a minivan without the sliding doors. Its aerodynamic frontend helps to improve fuel economy. A body-colored roof spoiler comes standard, as do 16-inch wheels and automatic headlights. Heated side mirrors, fog lights, and a power moonroof are also available. The new Sport version adds black/red racing-style garnishes to the front and rear lower fascias. The Fit is powered by a standard 130-hp, 1.5-liter four-cylinder mated to a 6-speed manual transmission or a CVT. The CVT is optional on the LX and EX models, but comes standard on the EX-L. With the manual, the Fit gets 29/36 mpg city/highway, while the CVT returns an even higher 31/36 mpg. For the best fuel economy, opt for the LX with the CVT; it takes out some weight, adds underbody covering for improved aerodynamics and gets 33/40 mpg, which is best in class. The Fit offers plenty of passenger and cargo volume, even rivaling some small SUVs. While the Fit is short in overall length, its longer, wider wheelbase allows for more passenger volume, especially when it comes to rear legroom which grows by almost five inches. Some of the new passenger room comes at the expense of rear cargo room, but the Fit still has its second-row “Magic Seat” for great flexibility. The second-row seat cushions can fold up, which gives plenty of space to store taller items, and with the second-row folded flat into the floor total cargo area is 52.7 cubic feet which is again, class leading (it more than doubles the Fiesta). The Fit comes with a standard air conditioning and a multimedia system with a 5-inch screen, Bluetooth connectivity, and a USB port. Upgrading to the Sport or higher trim levels adds even more features, including push button start, a 7-inch touchscreen, Apple CarPlay/Android Auto compatibility, HondaLink, and Pandora internet radio. Leather upholstery is optional, as is HD radio, a navigation system, and heated front seats. The Fit earned a full 5-star overall crash test rating from the National Highway Traffic Safety Administration (NHTSA). A backup camera is standard, along with antilock brakes, electronic stability control, and six airbags. EX and above models feature Honda’s Lane Watch system, which uses the car’s center display and a camera mounted on the passenger side mirror to show the blind spot along the right side of the car.